Featuring the original EZ-Skid Runners! This 4 x 6 chicken coop houses 12 to14 chickens for fresh eggs daily! The EZ-fit Chicken Coop is delivered partially assembled. Basic assembly skills required. Enjoy free-range, fresh eggs with your own chicken coop. 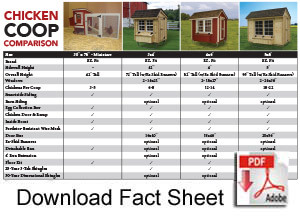 EZ-fit Chicken Coops come pre-assembled in sizes ranging from 3 ft. x 4 ft. up to 5 ft. x 8 ft. View overall heights. Made in U.S.A.
are moveable w/ garden tractor. Easily move your coop across your pasture or back yard with our EZ-skid Runners. Simply hitch up your garden tractor and you’re ready to go! 3 ft. x 4 ft. coops can even be pulled manually with the help of a few friends. Runners are zinc galvanized to prevent rusting.